My husband really loves baseball. In a throw down featuring Christen vs. The Atlanta Braves, I am not sure who would win. With the Braves’ first Spring Game with their new coach Alan Butts at the reigns coming up, my husband has been counting the minutes this week. 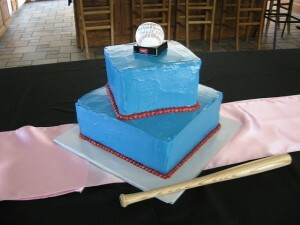 So in honor of baseball fans everywhere..I bring you..the Baseball Grooms Cake! I actually don’t know if the bride and groom who own this cake are Braves fans, but I like to think so since the colors are blue and red. I like how this is a simple, two tiered square cake topped with a baseball. The ball is inscribed with the bride and groom’s name and their wedding date. What a cute souvenir! This is a good way to incorporate your husband-to-be’s love of the game with your wedding. This was a lot smarter than my idea of wearing his “lucky jersey” over my wedding dress in a few of my bridal portraits.